The Year in Systems Thinking: How LO-cal Can We Go? A presentation to USAID on democratizing systems tools on the journey to self-reliance. 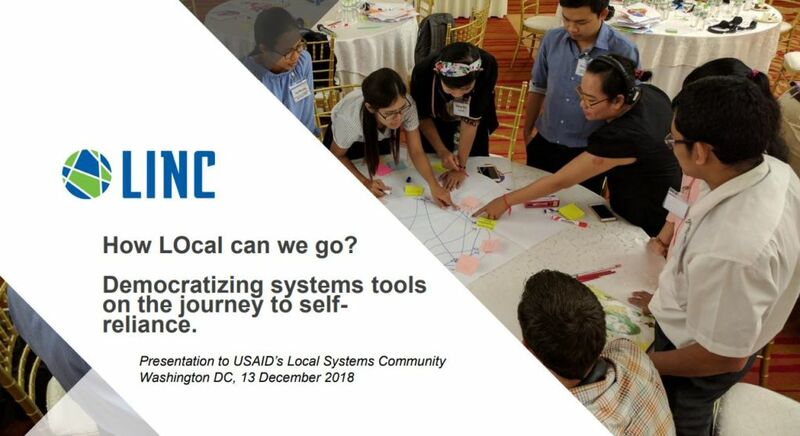 On December 13, 2018 LINC wrapped-up a big year for systems thinking in international development, conducting its seventh presentation to USAID’s Local Systems Community at USAID headquarters in Washington DC. The presentation provided an overview of our experiences over the past several years investing in the adaptation of systems thinking tools that are useful, accessible, and cost-effective for international development projects. Click this image to view LINC's December 13, 2018 presentation to USAID's Local Systems Community. Our presentation, entitled “How LO-cal Can We Go? Democratizing Systems Tools on the Journey to Self-reliance”, outlined our (subjective) observations on the state of uptake systems thinking, key milestones and challenges moving into 2019. Over the past several years we have noted a particular increase in the utilization of systems thinking tools such as network analysis, causal loop diagramming, outcome harvesting and political economy analysis. There is widespread interest in applying systems thinking tools as we have seen several examples of systems thinking applied successfully to international development programming, particularly program design. We see a number of challenges for systems thinking as we move into 2019: First, the uptake of systems thinking paradigms among donors requires the institutionalization of adaptive management approaches. Next, there is still much to be learned about the feasibility and cost-effectiveness of applying systems thinking tools to monitoring and evaluation. Also, much investment in orientation and training is required. And lastly, we all need to start thinking about systems tools as one more tool in our program design, monitoring and evaluation toolbox, one which can be employed as needed in conjunction with (not exclusive of) more traditional assessment tools. Click here to view the full presentation and send us your comments and questions.